Wanna Win a Go! Fabric Cutter? I just had to pop in and tell you that someone is having a giveaway for a GO! fabric cutter. I love my Go! cutter. I have used it a good bit and even designed patterns that use it too. What does it look like? I am glad you asked. 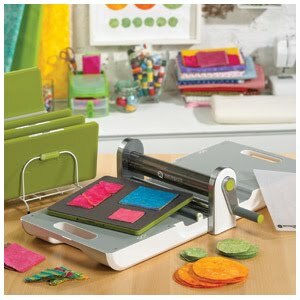 It is a very cool portable die cutter. 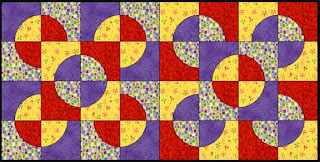 With it you can cut pieces for quilts. There are geometric dies, applique dies, even classics like the Drunkard's Path, Double Wedding Ring and Apple Core. The Circles can be used for making yo-yos too. I love the Chisel Shape and the Tumbler Shape. The triangles (and others) have engineered corners so that you don't have the "ears" to cut off. So, now are you ready to go enter???? 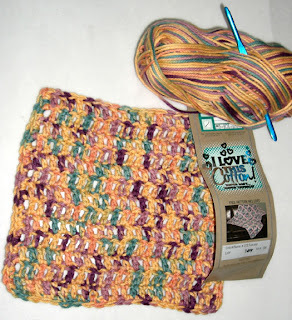 The giveaway is at SewCalGal's blog. You don't have to tell her that Gene sent you, but it would be nice. And those of you who already have a GO! cutter, you can enter to win a die of your choice. I hope you kept reading till you got to this part. Ha ha. First the "news": Today I spent judging at the Milestones Speech and Debate tournament. Let me see if I can paint a picture for you. I walked in and saw lots of smart, geeky and totally cool kids who were being kids. 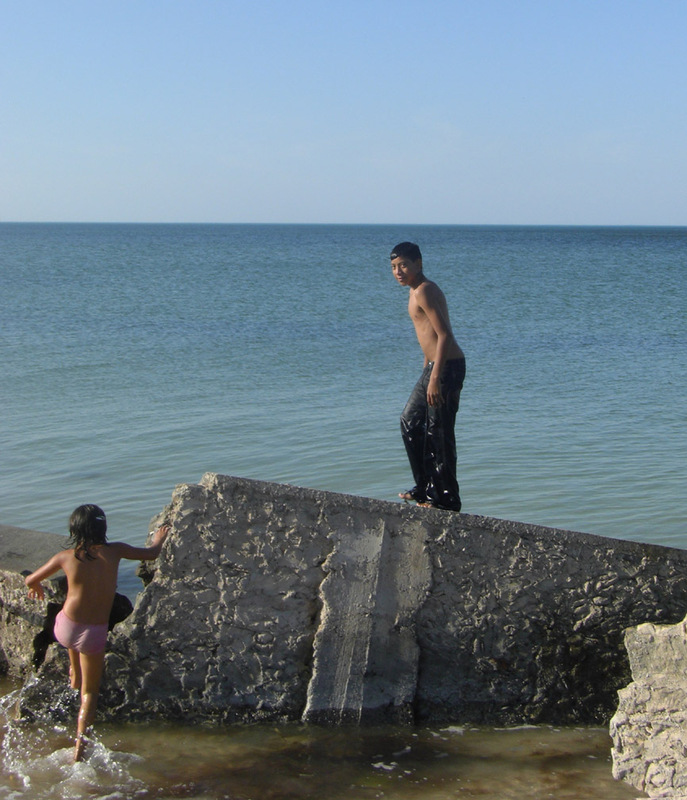 (some were running and playing, some were doing other things.) I signed in and got an orientation on judging speeches. Then I got an assignment with judging forms. I went to the assigned room and suddenly these "kids" did speeches that showed how much smarter they are than average. They had the deportment of adults (better than many I know!) They politely introduced themselves to the judges and thanked each judge for being there. Then they gave speeches. For some of them, the speaker reached in an envelope and pulled out a topic. After 2 minutes prep time --yes I said TWO MINUTES - they got up and spoke. They didn't have notes, cue cards just themselves to rely on. There are some smart kids out there and it makes me feel good to know they will probably be leaders in the future. I was happy to "waste" my Saturday off working to help them. I gave the best constructive criticisms I could and I was liberal with the (well deserved) praise. I had about an hour break time between sessions at one point. So I made a little trip to a craft store that was nearby and got some cotton yarn. I had made my previous dishcloths with acrylic yarn because that was what I had. I was so happy when I went in and this cotton yarn was on sale at almost half price. After I got home from judging I sat down to relax and grabbed the yarn and the smaller hook I had bought and made a lot of "knots" which is more commonly called "crochet"
I put the yarn label in the picture for you to see the brand. The fine print says that the color is "Tuscany." I love the warm and cool color mixture that leans toward warm. I got a variegated yarn because I feel that it is more fun AND less straining on the eyes than staring at one color. I love the way this worked up into a pattern. Each color is seen distinctly and blended with the others. The dark purple and the aqua seem to almost form chains of color. It is almost too pretty to be a dishcloth. But wait - it will make a menial chore more enjoyable. Someone asked to see the convergence piecing. I did take a picture but it is on a different computer. I promise to post it later. Maybe I will have the change I have decided to make to it done by then and you can see it both ways. I really enjoyed Ricky Tims book and method. 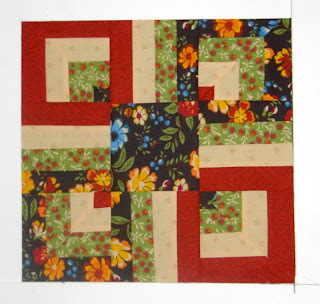 I am sure I will do more of the convergence quilting. Have a great "rest of the weekend!" You see Greg at Flat Out Quilting had sent me a cryptic email asking "How many Sharpies do you have?" (I have a lot, but I think I said 2 or 3 dozen) I finally coaxed out of him the reason for the question. That fabric is Oodles of Doodles by Ricky Tims. When I saw it online (pre-release) I loved it. I still do. Oh yeah, my Sharpies are riding in style now! Convergence - Here is what is really really strange about this. A-I had no clue what fabric Greg would use for this. B- I had decided to try something new to me. So the idea to make a Convergence quilt with a Ricky Tims fabric just happened to converge with the arrival of my lovely Sharpie pen carrier made with Ricky Tims fabric. Talk about Mysterious and Magical. And now confession time. I did my first convergence with the fabric shown. It doesn't pop as much as I wanted it to. So I am thinking it will get some (big gasp here folks) applique on it to add some splash. There was not enough differentiation of color in the parts that converged. However, I will certainly be doing this again and of course trying some of the other things in this delightful book. I got the book for Christmas and it is a very welcome addition to my library. Hey, it occurs to me that Sharpie is permanent on fabric. What if I........?????. oh yeah! I think I will try it. A post over at Ardea's Nest clicked with me. You see she got a crocheted dish cloth in a swap. Now I have to confess that I wash dishes by hand. My favorite dish cloth frequently goes straight from the dryer back into service. It happens to be knitted and was a gift to me from a sweet young lady. I have considered hiring her to make me a few more dish cloths. Now, let me say: I don't knit. I tried it a couple of times and never could seem to "get it" However, I can crochet without thinking much about what I am doing. I have no idea why it never occurred to me that I could crochet a dish clothe and it would be very similar. Duh! I didn't worry about it being exactly even along the edges or the stitches being even tension either. I made it while I was watching a television episode I had recorded. (Okay, it was House, MD - I can't help it, it is the one show I watch regularly) I sped thru the commercials, so this probably took 45 minutes or less. I will be riding with a co-worker to a meeting tomorrow, so I may just take some yarn and my crochet hook and make another one while we are on the road. The Layer Cake Quilt Along is going pretty fast. We are already at block seven and I *think* we will be making 12 blocks. The finished quilt is supposed to come out at 64" by 80" which is a nice little quilt. I have already been asked for "first dibs" on this one. 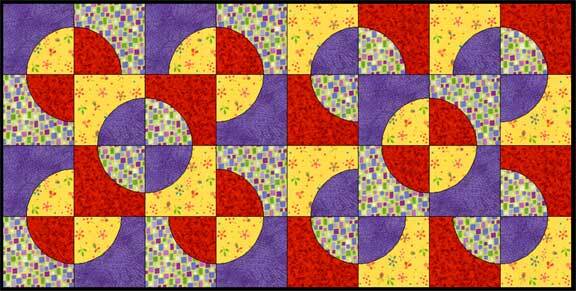 And that was sight unseen, based on the Jelly Roll Quilt along quilt that she bought. . I have not yet decided on my accent fabric or my outer border fabric. I am thinking a nice neutral mottled tan for the accent fabric and then a rich color -undecided as yet - for the outer border. This weeks block was designed by Celine Perkins of Perkins Dry Goods. It was a fun block to make and was not difficult. even though it looks complicated. I have discovered that these sampler type quilt alongs really increase my skills and confidence. Since this is only a two block per month commitment, I find it easy to fit in my schedule. 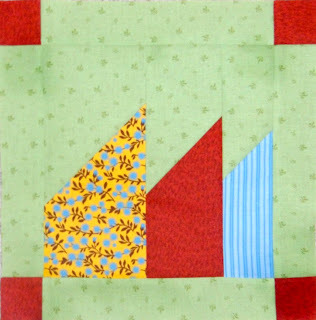 I think my color choices were a touch bland in this block but it will work out fine in the finished quilt. I am sure of it. I am considering making a sampler from blocks in the Quiltmakers 100 Blocks magazine. As I have issues from last year and this year, I think I could easily make a few samplers. Ha ha. Today I saw someone mention the Accuquilt GO! 12" finished block die set. I looked it up to see which ones I owned already. I have a total of 15 dies for my GO! cutter, but I only have 3 of the 8 dies in that set. Still I have a healthy collection of dies. I thought I would put my "cataloging" of them right here so I can see it when I check the "Deal of the Day" on Accuquilt.com I know that I can always edit the post to keep it up to date. I wish my fabric was this well organized! ¨ GO! Parallelogram- 3 3/4" x 3 1/2"
¨ GO! Rectangle-3 1/2" x 6 1/2"
I also pondered dies that I might like for them to develop. I would love a smaller chisel die, but honestly I can't figure out what dimensions I would want it to be. Quite a while back (October to be exact) I wrote a Dear Gene Letter. It was all about a project I started using a Drunkard's Path block. I found came across pulled out the package of pieces that I had cut and the small section that was already sewn. I decided to follow my Irish Muse and sew these together. So that is what I did on Sunday evening. I sat and pinned the pieces together while I watched a movie. Then I sat and sewed them. I pulled up the diagram on my computer and laid them out. Then I joined each section together until I had this piece.
. Just don't look too closely, there are some seams that didn't match up perfectly. If you are a "quilt policeperson" don't grimace too hard, you will crack a tooth! You will notice some extra sections there on the left. If you look back at the Dear Gene letter, you will see that I still have half of this to go. However the right half is completed. I don't know that I will ever make a big Drunkard's path quilt. But I do like my layout of it. I saw this great video about using various fusible products by Therm O Web. I confess I once bought Heat and Bond Ultra and tried to sew thru it. Trust me, you don't want to do that. BUT you can watch this video and find a use for it. Now you can make some fun Valentine's day decor. Hi again. You may remember that I told you about my trip to Mexico. You may also remember that I have FACD (fabric acquistion compulsion disorder) also known as "I want more fabric in my stash." But I am sure none of you suffer from this. (ha!) So anywho, while I was in Mexico, I went to the Parisina store(s.) I actually shopped in three of them, but only bought fabric in one of them. The fabric is sold by the meter rather than a yard so you get a little extra. NICE, huh? Oh yes, that picture shows some other "stuff" but I will get to that later. Do you see how these three fabrics will all work nicely together? Well, I have no idea if they will end up together but it is possible. Now the other stuff: At the top you see my cutting mat (one of them) covered partially with wax paper. The wax paper is to protect it from the Mod Podge (not pictured) that I was using to follow a tutorial over at Tonya's Sewing Room. I don't have the magnets yet for the back, but I did get the fabric put on back of the gems. I also used the Mod Podge to put some fabric collage on a round box lid that I had painted and am not happy with. (The box has been sitting for years unfinished!) So you see both fabric and painted surface there. Still more to do on the rest of the box and perhaps on the lid. I am undecided at this point. My friend and local brilliant artist/quilter, Norma, runs a couple of blogs. One of them is all about winning stuff. It is called "Quilty Giveaways" You may remember that I love winning stuff. In fact, I just won TWO giveaways. 1. From Tonya's Sewing Room I won a $50 gift cert from CNS stores. So last night I bought a new piece of luggage to replace the piece that got mangled on my trip to Mexico. I spent a whole ninety four cents of my money on it . NICE!!! 2. From Mary at Quilt Hollow I won the Mix & Match Accuquilt Book. So don't be surprised if you see a Quilt top made from the book on my blog. Not much to say about these. A friend said his wife (or mother in law ??) wanted some more of the potholders and trivets I made. I think she is going to send them to friends. Cool! So I asked, "What colors or designs?" The answer was "Whatever"
There are two matching sets as requested. The ones on the left have some leftover Neptune honeybun strips in them. The ones on the right have leftover jellyroll strips from ??? maybe Simple Abundance??? Anyway, I also added other stash stuff to finish them. As usual, nothing in it is squared up and even. They are wonky and fun -- just like me! 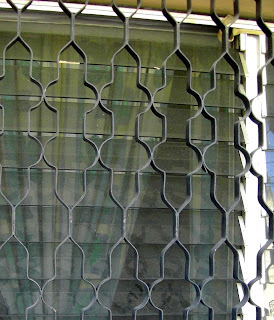 I am thinking that part of my inspiration for this may have been this window grate from my trip to Mexico. I saw this and had to snap a photo. I love looking at hibiscus. Within walking distance of where we stay is Santiago Park. The church there is a lovely shade of yellow and I love the design also. Here is a picture I took. Finally - just to make you long for summer even more - here is a picture that I took on January 7th at Sancristiano on the beach front. Block #6 is by Toby Lischko. Here is my version of the block. See the nice little bit of blue in there? Yeah, that makes me happy. So while in Mexico, I got in a bit a a jam! As you can see in the picture below it was a real JAM. See that giant jam jar? There I am right in it. Okay okay, it was a bit of trick photography...but we were having a good time. 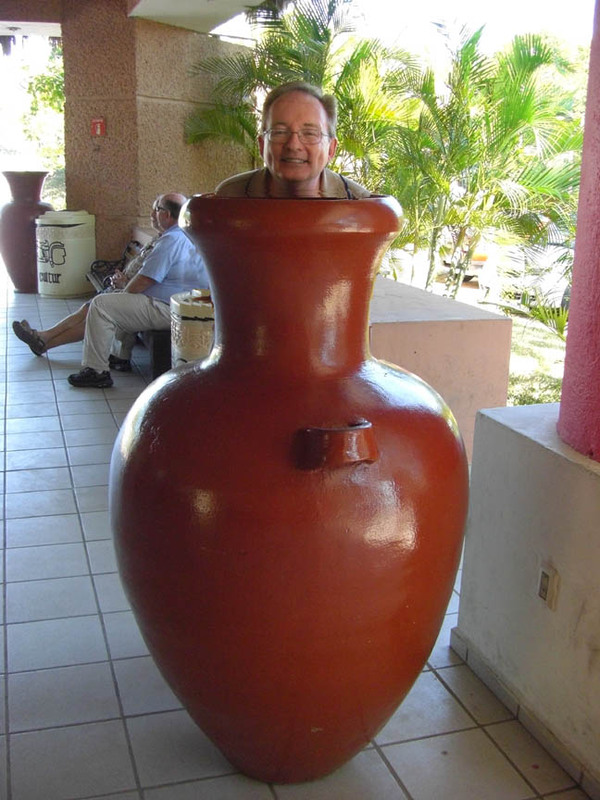 I knew you would want to see this huge vase. It is a shame there weren't flowers in it, instead of an old "gene weed" Ha ha. After seeing the flamingos we rested in this nice shady courtyard. Then we were off to find some lunch. Having been there before we knew where to go - Nicte-Ha (pronounced nic tay HA.) 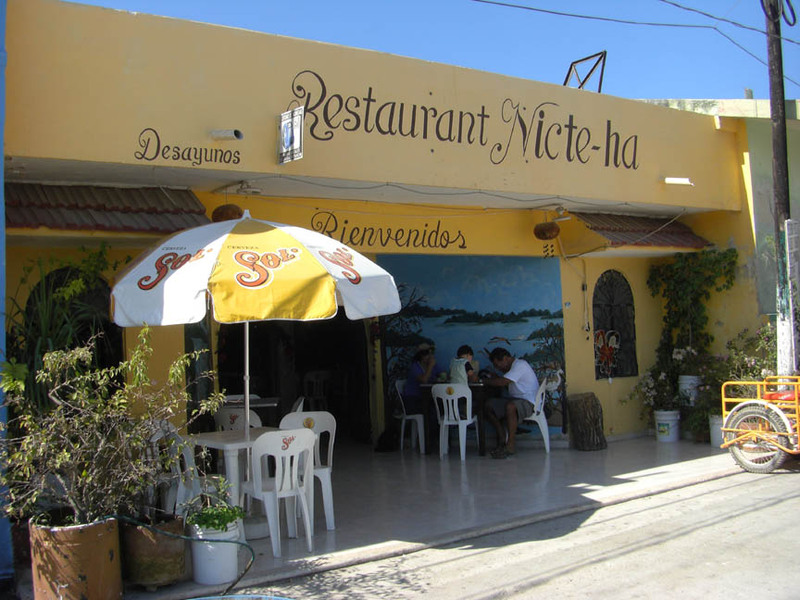 The name is Mayan for "Water Lily" This little restaurant backs up almost to the beach and the fish comes in daily from the local fishermen. 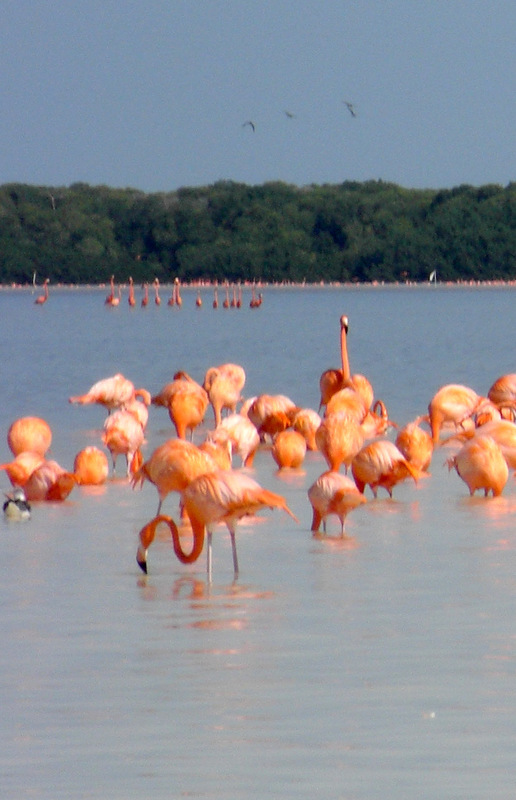 This is right in Celestun, Mexico. I had the fresh fish fillet in garlic sauce. (filete de pescado al mojo de ajo) It was yummy! I did not have a cervaza (beer) but maybe I should have. Ha ha. 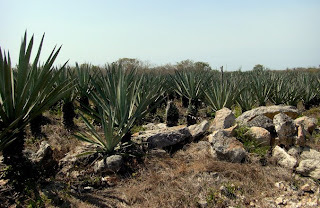 As I mentioned in a previous post, I went on a trip south of the border. So I am going to share a few pictures in with my other ramblings. There will be quilt related information too. I wasn't making anything while I took my break, but I did think about quilting when something caught my eye. Thus I do have some inspiration pictures. 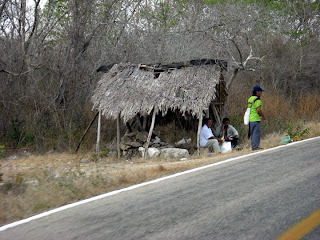 One of the joys of the Yucatan is the sights that are rare in the states. 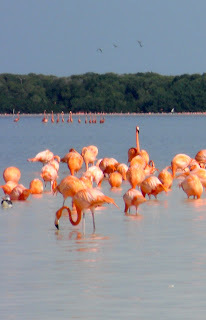 We went on a second trip to the flamingo nesting/ feeding area to see these beautiful creatures. I love the one at the front left - just off center. The guy on the wall apparently saw me. His eyes seem to look right into the camera. While wondering the streets, I saw this grating on a window. What did it make me think? 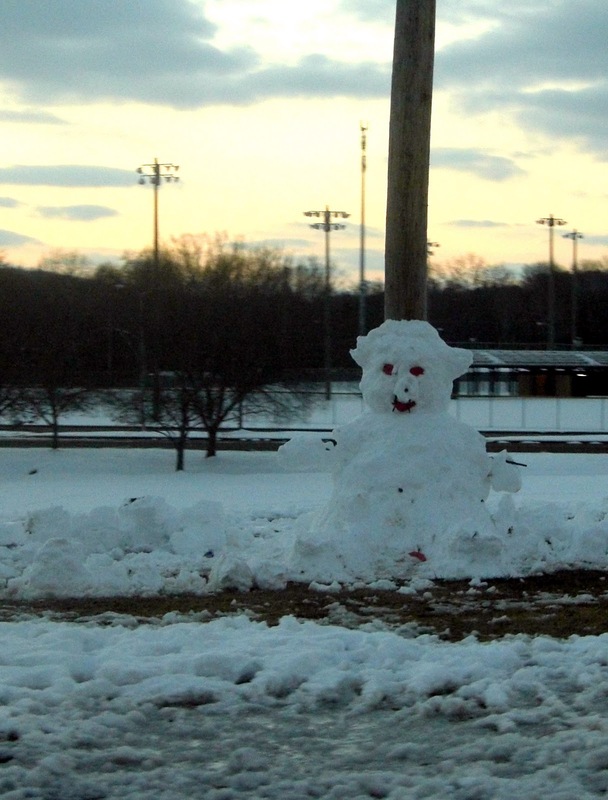 At least the snowman was smiling at us. We saw several snowmen; some higher than six feet tall. There is still snow on the ground here. I am thankful for warm quilts. Tonya at Tonya's Sewing Room is giving away a $50 gift certificate to CSN stores. If you want to enter click on the link. My suitcase got mangled on my recent trip..so if I win, I will use the gift certificate to buy a replacement. HI folks! My break was great. I went on a little trip during my break. I decided some sun would be nice. It wasn't that cold when I left Alabama, but it wasn't all sunny and toasty. My bones wanted summer back. We had a white Christmas. It was still cold to me. So we headed South of the Border. It required a passport. This pictures are from my previous trip as I haven't downloaded the new ones. I really took it easy and enjoyed a really relaxing time. Then I got a shock! Our flight home was cancelled. What Happened? If you haven't been under a rock (or on a break!) you have probably seen on the news that Atlanta GA got snowed in. We had to fly home on a different airline, on a different day, and a different route. But we made it back to Alabama. There is still a huge amount of snow on the ground and possible low temps of 11F tonight. I hope you are staying warm. I think I will sleep under a nice warm quilt tonight. Okay, I am sneaking in one post. I had to tell you that Stray Stitches is having a 300 follower giveaway. So go on and enter, but give me the prize, okay? And in keeping with my previous post I will not reply to comments to this post. Thanks.